How long will this money last? EDIT: I've changed the 10% to 5%. You would be able to withdraw 10k for 14 years. Note, in an ordinary annuity the cash flow is at the end of each period, so if retirement starts at the beginning of year 1 with 100k, the first payment happens at the end of year 1. To calculate the balance in year 14, after the last 10k payment, this formula can be used. Your principal will last indefinitely if your interest rate (or equivalent) is at least 10%. Otherwise, spreadsheets come in very handy for these sorts of questions. 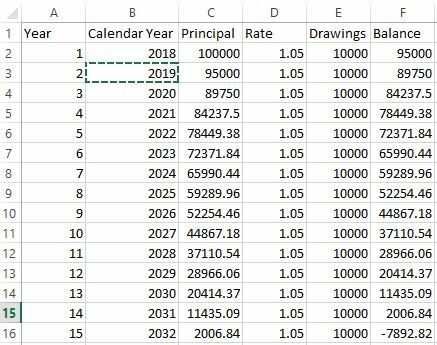 First row: Year (Y=2018 or current year), Principal amount (P=100,000), Rate of change (R=1.05 for 5% interest), Amount Drawn (D=10,000), Balance (B=PR-D). Subsequent rows (referencing the variables in the row before it): Y+1, P’=B, R, D, P’R-D.
Look down to the row where the Balance column is first negative. The first column (year) tells you the year that the funds run out. Once you’ve set up your spreadsheet, you can change the interest rates or drawings for particular years or year ranges. Not the answer you're looking for? Browse other questions tagged investing retirement-plan compound-interest or ask your own question.